What if you stimulated new growth for your global consumer brands by adding fresh value propositions with more local flavors? Kimberly-Clark is an American multinational corporation that produces mainly paper-based personal care products for consumers, including facial tissue (Kleenex brand), feminine hygiene products (Kotex), toilet paper (Scott) and disposable diapers and baby wipes (Huggies). 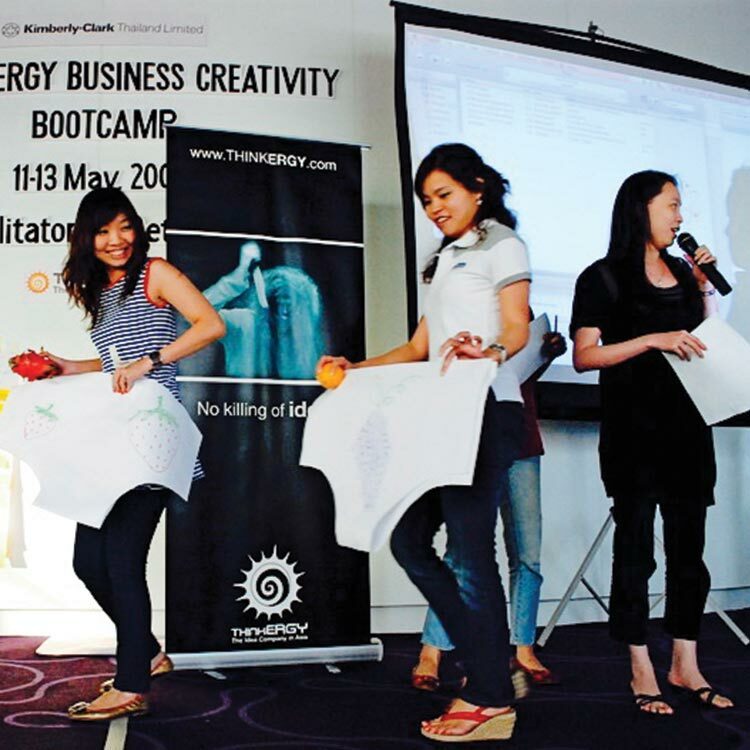 Thinkergy helped Kimberly-Clark’s Thai subsidiary to create a range of new value propositions (products, services, solutions, and experiences) catering to the lifestyle and habits of Thai consumers. In an intensive 2 1/2 day workshop, we took three innovation project teams of Kimberly-Clark through the five stages of X-IDEA (Xploration, Ideation, Development, Evaluation, Action). Over the first 1 1/2 days, Thinkergy encouraged the three teams to deeply and emphatically explore the lifestyles of archetypical Thai consumers with a mix of Xploration Tools (such as A Day In The Life, Customer Journey Map, Walk A Mile, Empathic POV, among others). The teams gained a range of novel and important insights into consumer wants and needs and emerging market trends. Each team used these to frame a specific Final Challenge. On the final day, the teams worked with these challenges to create meaningful new paper-based value propositions for the local market in an IDEA workshop. In a highly energetic, entertaining morning of creative play in The Idea Playground, each team generated close to a thousand raw ideas. In the subsequent Idea Studio, the delegates then transformed their most intriguing raw ideas into fully-fledged concepts for meaningful new paper-based products, services, solutions or experiences for local consumers. In the final two stages, Evaluation and Action, the teams rapidly prototyped the most promising concepts to understand how to make these real, and finally pitched their 5 top concepts in a concluding Idea Market to top management for support and approval. Interestingly, many of the most appealing top concepts catered to key customer insights into the local lifestyles and habits of particular urban Thai families gained during the initial Xploration stage of X-IDEA. For example, one new product concept focused on refreshing consumers after work before heading out for dinner. Another concept added convenience for parents in need for a diaper for their baby while being out shopping. And yet another concept provided a new solution for paper tissue for urban commuters who are trapped for hours in traffic jams. Reach out to us when you’re ready to work out how X-IDEA may help you grow your global brands by creating new value concepts that cater to local lifestyles.